Most of the games use graphics so let’s learn how to display it on the screen and apply some transformations to it. You will also meet 3 new object types: textures, bitmaps and sprites. Bitmap – it inherits from Sprite and wraps a Texture object for on-screen display. Let’s do a simple example so it will be more clear. First, I suggest you to download Gideros Asset Library (Contains set of backgrounds, tilesets, texture, sprites, icons and music files for beginners like us) . You will find this Character-Pink-Girl.png in the Tilesets\PlanetCute PNG directory. I am also including all files needed for this tutorial in the ZIP at the end of the post. application:setKeepAwake(true) --prevent screen dimming on your phone. local girl = Bitmap.new(girlTexture) --create bitmap girl that holds girlTexture texture. And there you have it! Run Gideros Player and you should see 2 girls (one upside down) on the green background. As you can see we used the same texture for 2 different bitmaps. Texture is just a picture and bitmap is an object that contains this texture and does all kinds of modifications on it. -- who is people? What objects are in group people? As you can use grouping bitmaps into sprites is useful because you can manipulate the entire sprite(group). Sprite can be a little confusing word for those who remember C64 and earlier because at that time sprite meant objects composed of images. In Gideros sprites are used to group other objects (or separate them in different layers) as images, texts and shapes. In example above we made sprite people containing all “people”. You could also make a sprite “nature” that would contain bitmaps like trees, rocks, sun etc. 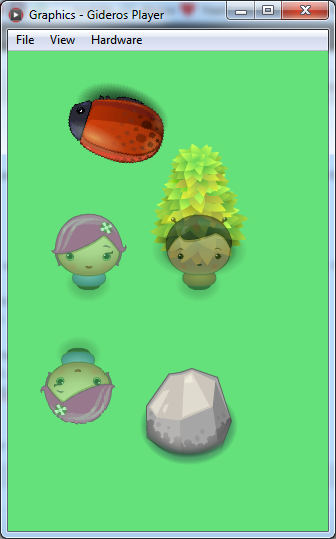 Grouping elements into sprite is useful because we can for example turn off all objects contained in one sprite. In example above we set transparency of entire people sprite to 50% so you can see all people are partially transparent. The last thing is the rotation of a bug. We will cover events and event listeners soon so don’t think about this too much. In short: We add event listener to stage that calls a function every time a frame changes. What does this function do? It simply rotates the bug 1° counter clockwise. Note: the bug is not rotating around center because the texture is not square. You can download all files (graphics and main.lua) for this tutorial here.